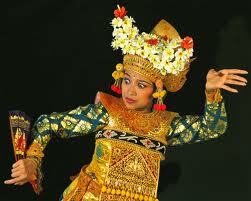 Bali is a tourist destination is very popular with budayannya very interesting. Ubud area every night, tourists can watch traditional dance performances Bali.Di several places in Ubud Bali held a variety of dances from various dance studio, usually dance popular among the tourists, among others, namely Legong, Kecak dance, Barong dance, etc. .
Tari Legong who became one of the favorite dances watched by the tourists both domestic tourists and foreign tourists is a dance that developed in the palace or the palaces in Bali.Tari Legong is usually danced by two girls and Legong dance itself has many varieties or types . The Kecak dance is a dance performed by many people, accompanied by shouting or singing with a melodious rhythm of dozens of men who sat around in the arena of dance to express “smack-smack-smack-smack.” dance is the theme or story of the Ramayana whereas the Barong dance which became one of the favorite dances watched by the tourists is a dance that tells the endless battle between Barong as a symbol of goodness and Rangda as symbols next kejahatan.Di dances are still many more dances that can be watched in Ubud and the areas other areas in Bali.